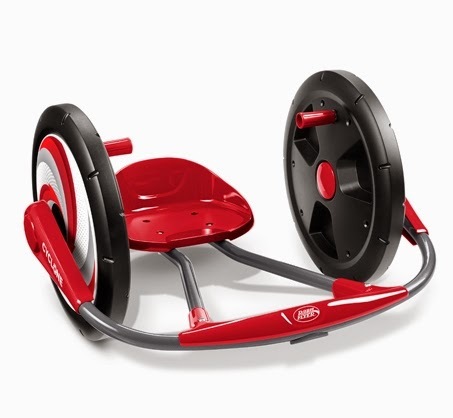 Disclosure: I received two products for feature from Radio Flyer. All opinions are my own. Our family enjoys Radio Flyer products on a daily basis and the kids can't get enough of this classic brand. When our friends come over and their kids play with the Radio Flyer toys, guess who orders the same for their children? For the holidays this year, ride-ons are pretty darn popular. Mason is thoroughly enjoying riding his Fire Truck and I know that both he and Kenzie are going to be excited about the Cyclone. 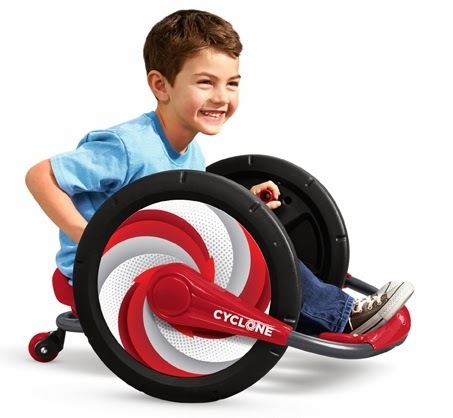 Zoom, Spin and Grin with the Radio Flyer Cyclone™. Using arm powered action, you can spin 360⁰ for unlimited fun. Whether you are zooming forward or rolling in reverse, the 16” wheels offer a smooth ride. This ride on also features comfort handgrips to guide your ride and an ergonomic seat and frame for a comfort ride. The solid steel frame and rear caster wheel ensure years of classic Radio Flyer fun. This is recommended for children ages 3-7 with a weight capacity of 69 lbs. 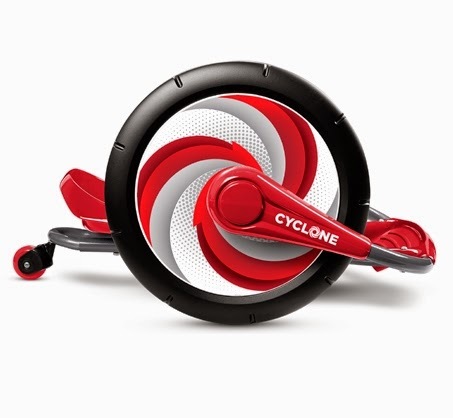 The kids will definitely have a grand time cruising and spinning in this awesome Cyclone on Christmas morning. 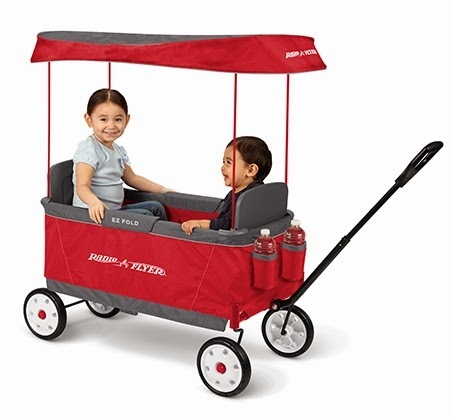 For heading to a local celebration or game, the Radio Flyer Ultimate EZ Fold Wagon is a must. It's kind of like a party wagon for tots. Comfortable ride with snacks and drinks at an arm's reach while being in the shade. 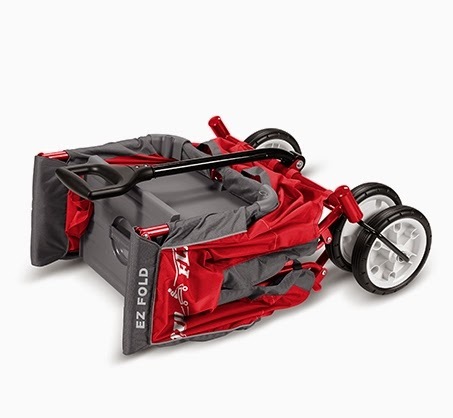 Radio Flyer’s new Ultimate EZ Fold Wagon is designed as a full size wagon for 2 kids that folds compactly. With an easy one hand fold, you can take or store the wagon anywhere. Two kids ride comfortably with 2 seats, 4 cup holders, seatbelts for added safety, and a removable canopy. The telescoping handle is for easy transport when folded. The DuraClean™ fabric is durable and can be easily wiped clean. A full size wagon with a compact fold to take & store anywhere. For ages 1½+. Do you kids have Radio Flyer products under the tree this year? Anyone picking up some last minute gifts this week? My granddaughters would love the EZ Fold Wagon to play with. They could take turns pulling each other around in the Summertime. My son had a Radio Flyer wagon when he was tiny. They have such great quality products. They last forever. The EZ Fold Wagon is really, really cool! That would absolutely solve the problem I have with wagons (nowhere to put them when not in use - but flat? flat I could do). I want to get a wagon like that. Ours broke, a different kind, and I am so sad. I have looking at these. I am surprised the Ziggle is not here, that thing is so much fun. I bet the Cyclone is also fun, we might have to add that to our collection. While the first one looks like loads of fun (and I like the idea of the extra wide wheels for added stability and protection, the EZ fold wagon looks like a must have, here in SoCal. Wow this looks like a blast! I would love this if I were a kid. Maybe when my son is older, I can watch him have fun with one!